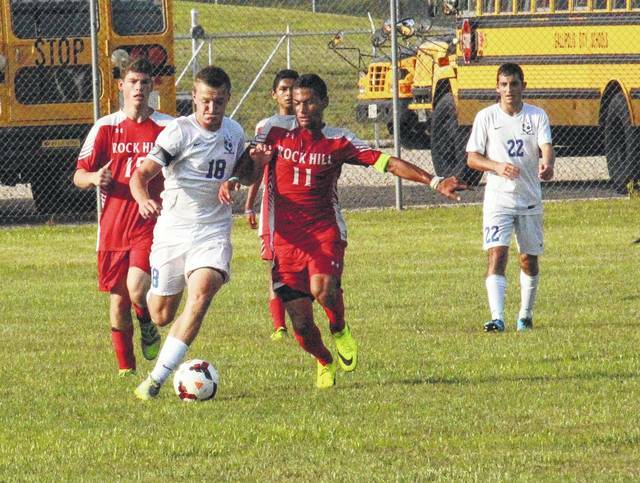 CENTENARY, Ohio — Simply put, visiting Rock Hill had the Blue Devils’ defense seeing red. That’s because the Redmen, spearheaded by striker Victor Aguilera with the opening four goals, rolled past Gallia Academy 7-1 on Thursday in an Ohio Valley Conference soccer match at Lester Field. With the critical OVC victory, the Redmen raised their record to 2-0-1 —as they have also defeated Chesapeake while tying South Point. The Blue Devils are now 0-2-1 — and 0-1-1 in the conference with the 2-2 tie against Fairland. The Redmen, in fact, scored the game’s opening seven markers — as Gallia Academy averted a shutout with only three minutes remaining. Ian Hill had the late goal for Gallia Academy, as Emmanual Valadez collected the assist. Otherwise, it was all Rock Hill from the 24-minute mark of the opening half on. Aguilera, a junior, got the Redmen on the board at the 23:11 mark of the first half, then made it 3-0 with four minutes remaining in the period. In both instances, Jake Blagg recorded the assist —as Aguilera scored his second goal with 12:19 left in the first on a penalty kick. The PK resulted from a Blue Devil handball call in the box. Aguilera continued his personal onslaught in the second half, scoring an unassisted tally only two minutes and 44 seconds in for a commanding 4-0 Redmen advantage. Blagg then scored the next two Rock Hill goals — and only two minutes and 14 seconds apart for the 6-0 cushion. His first was at the 29:53 point off a Parker Knipp assist, as Jasson Aguilera assisted on the second score at the 28:39 juncture. Jasson Aguilera rounded out the Redmen scoring with an unassisted goal with 22 minutes to play. While the Blue Devils did control possession prior to the scoring barrage, they couldn’t quite get the necessary goal that might have altered the outcome early on. The first 15 minutes of the match was played primarily between the goalboxes, but quickly became dominated in the Blue Devils’ defensive half and even third. That’s because, in part, the Redmen had a stranglehold on the midfield. The Blue Devils didn’t defend Victor Aguilera well at all, either. The Redmen doubled up Gallia Academy in shot attempts, 16-8, and held a 3-1 advantage in corner kicks. The Blue Devils did have two excellent opportunities to score, but Rock Hill goalkeeper Kalch Kidd came up with two tough but quality point-blank saves. With GAHS trailing 1-0 at the 18:22 mark, senior Pierce Wilcoxon won a wild scramble for the ball just in front of the net, but Kidd snatched Wilcoxon’s rocket shot from less than 10-feet away. Then, 17 minutes later, Kidd —going to his knees to make the stop — denied Justin Day of a potential deficit-slicing goal. Instead, Rock Hill held its 3-0 halftime advantage, and eventually scored three second-half goals in an eight-minute span for the insurmountable 7-0 lead. The Blue Devils will hit the road for the first time this season on Tuesday, when they travel to Jackson for a now non-league encounter. Gallia Academy’s Andrew Toler (18) battles Rock Hill’s Victor Aguilera (11) for possession of the ball during Thursday’s Ohio Valley Conference soccer match at Gallia Academy High School’s Lester Field.